On December 18th, Deimos posted a topic to discuss potential site mechanics of topics and who owns them that gained a wild variety of responses that's worth checking out if you haven't already: click here to read it. Something that has been planned for quite a while has been added on December 22nd. Shortlinks! You can now share topics via the shortlink that is available in the sidebar of topics, over here. 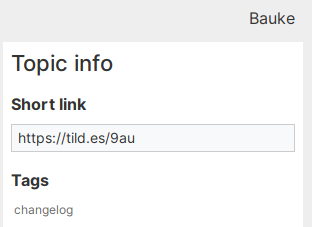 The shortlinks are just "https://tild.es/topic ID" where "topic ID" are the 3 characters of a topic's URL. So https://tildes.net/~tildes.official/9au becomes https://tild.es/9au. More options like linking to specific comments, users and other stuff is planned, don't worry! Clicking the link will take you straight to the registration page with the code filled out (I can't check which ones are and aren't used, so this won't be updated sorry). Codes from Bauke: Code 1, Code 2, Code 3, Code 4, Code 5, Code 6, Code 7, Code 8, Code 9, Code 10. Codes from Deing: Code 11, Code 12, Code 13, Code 14, Code 15. Codes from Clerical Terrors: Code 16, Code 17, Code 18, Code 19, Code 20, Code 21, Code 22, Code 23, Code 24, Code 25. Codes from Cocoa: Code 26, Code 27, Code 28, Code 29, Code 30, Code 31, Code 32, Code 33, Code 34, Code 35, Code 36, Code 37. Codes from Ducks: Code 38, Code 39, Code 40, Code 41, Code 42, Code 43, Code 44, Code 45, Code 46, Code 47. In the month of December, 17 commits were made by 3 contributors, changing a total of 19 (+224|-205) lines. 14 issues were opened and 6 issues were closed. An average of 0.47 issues were opened and 0.20 issues were closed each day. The average time to close issues was 45.36 days or 1088.60 hours. cfabbro with 2 issues created. uselessabstraction with 1 issue created.